I have created a bunch of slide layouts but they dont seem to be available when trying to use them for a slide layer. The only options available are feedback layouts. Can I not use a template layout that I created for a slide layer or does in just retain properties of the base layer? Hi Rick and welcome to Heroes! 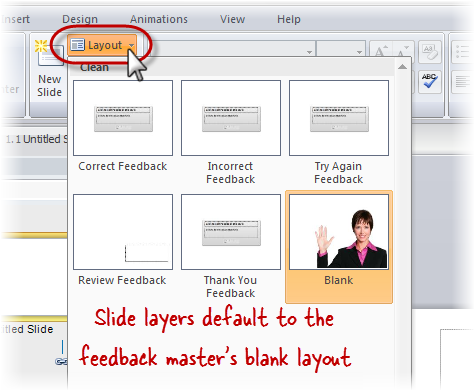 When you add layers to a slide, they'll be based upon the feedback master's blank layout by default. Select the layer that you want to change in the Slide Layers panel. Then go to the Home tab, and click the Layout drop-down list. Select the layout you'd like to use. To modify your feedback master or add new layouts, take a look at this tutorial. I'm using articulatie storyline 2 for a short time. Things go well! I like it, but I have a problem with the slide layers. When I'm creating a new layer on top of a base layer, it has a lay out I created in the master slide. I can change the layout, but it takes time everytime i create a layer. When I'm creating a new layer i want it to be blank. Can you help me? Hi, LI IL -- Thanks for your question! You may want to upload your file to help others get a better understanding of the behavior you have described. And in addition to the tutorial Ashley already shared for how to modify your feedback master or add new layouts, you may also want to check out this material on Working with Layers and Using Slide Masters. As Ashley mentioned above, it should be defaulting to the Feedback Master Blank Layout. Is this not what you are seeing or have you edited this layout? You are welcome to share your .story file if you'd like us to take a look. I also have the same problem but when I follow your instructions (start with Slide Layer, go to Home, click Layouts), I still get the layouts that were in the slide layouts, basically feedback slides. I would like to use one of the slides in my Master. Slides use Slide masters, layers use Feedback masters. If you want a layer built on a slide master, you need to copy the layout from the master to a new Feedback layout. You can check out the directions for Slide Masters for Storyline 360 right here. That should get you started and feel free to pop in with any additional questions. "Kim, Slides use Slide masters, layers use Feedback masters. If you..."